The 2017 County Championship season was yet another disappointing campaign for the members of Glamorgan. Three wins and seven losses led to a seventh-place finish and with the four-day game up there as a priority, improvements will need to be sought sooner rather than later. The three victories included a superb run chase at Swansea with opener Nick Selman carrying his bat for 116, including hitting the winning runs. A week later, a good team performance at Worcester led to a nine-wicket win against a team who would ultimately get promotion. But with no further wins coming until the last month of the season, with two losses in two days, three losses in three days and being bowled out by a 16-year-old versus Derbyshire, the four-day scene just wasn’t good enough. 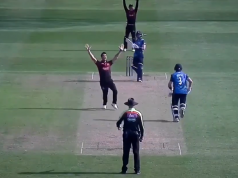 The Royal London One-Day Cup was a mixed bag with four wins and four losses. Narrowly missing out on qualification to the knock out stages by one point was frustrating. A memorable one-run win at home to Essex and a fantastic 330+ run chase at Hampshire were highlights. A brilliant T20 campaign saw Glamorgan finish top of the South Group then roll-over Leicestershire in the quarter-finals, taking them to Finals Day for the first time since 2004. Ultimately losing in the semi-finals to Birmingham, they at least gave the West Midlands club a bit of a scare towards the end; a memorable day for players and supporters. The 2018 squad now boasts Australian Test match player, Shaun Marsh, but with the retirement of Jacques Rudolph and Will Bragg, and with Colin Ingram playing white-ball cricket only, the batting line up looks very inexperienced. Lots will rest on the shoulders of Marsh, but with proven performer and wicket-keeper/batsman, Chris Cooke, and an emerging group of highly promising young, Welsh players, it will be interesting to see if they can improve on the low number of batting points over recent years. However, the seam bowling attack remains strong, possibly one of the strongest in Division Two. Championship captain Michael Hogan took 50 wickets in 12 games last year, at an average of fewer than 21 runs per wicket, and he’ll surely be leading the way in possibly his final season. His experience will be nothing short of invaluable and, with teams who can take 20 wickets more often than not the ones that earn promotion, the sums towards success won’t be too difficult to work out for Hogan and his charges. Carmarthen’s Lukas Carey, aged 20, has taken 48 wickets in his 14 Championship matches so far with his right-arm, fast-medium seam bowling. Glamorgan have uncovered a gem of an opening spell bowler already mentioned in England circles if fitness continues to improve. Australian Shaun Marsh is no stranger to English domestic cricket, with Yorkshire also taking place on a CV that has seen him average nearly 40 in 30 Test Matches. The middle-order man has also played over 50 ODIs, while T20 duties lie with the Kings XI Punjab and Perth Scorchers – making him a versatile asset in all three formats. The club will be hoping for at least similar run in the T20 under Colin Ingram as captain, and still to sign a second overseas player for the tournament. Qualifying for the knockout stages of the Royal London Cup would mean a more consistent 50 over campaign and something that should definitely be on their wish list. For Glamorgan to finish higher up the Championship table, a lot more application and patience will be required, even making them more difficult to defeat would show some real progress. A very young squad, some still at University could well face a tough time. Going up the ranks together in the club will hopefully bond them together even more over the summer. Opening fixture: v Gloucestershire, Friday 20th April at Nevil Road.